Call For FREE Estimate Today! Sealcoating Orlando parking lots is an important facet to parking lot maintenance. Left untreated, asphalt pavement will deteriorate rapidly. The asphalt binder that holds the pavement together begins to oxidize and weather soon after installation. For more than twenty years, property owners and managers have selected the CSG Sealing team for their Orlando sealcoating jobs. We use industrial strength products mixed to manufactures specifications to ensure maximum coverage and long lasting results. Our Orlando Sealcoating paving service will protect, repair, and enhance asphalt pavement, greatly improve the property’s curb appeal. Florida is known for having some of the sunniest days, which is a great attraction for tourists. Orlando, the home of multiple well-known theme parks, averages 89 sunny days and 147 partly sunny days! This is why in Orlando, sealcoating is especially important as it can protect your asphalts surface from damaging ultraviolet rays that will dry it out. While the state of Florida is blessed with lots of sunshine, there is also a significant amount of rainfall. The state of Florida gets 53.58 inches of rain each year. That’s 14.4 more inches of rain than the national average. So, why is this important to you and to your asphalt pavement? Moisture penetrates the asphalt causing further damage and deterioration to the pavement. Without sealcoating, Orlando parking lots suffer a one-two punch of blistering sun and an over abundance of water. 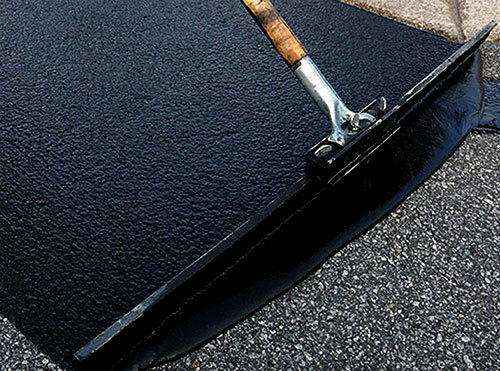 We seal the top of the asphalt, preventing water from penetrating the surface of the pavement and protecting the top layer of asphalt from oxidation and wear caused by exposure to the sun and air. Not only does this process extend the life of asphalt, but also you greatly reduce the amount of money you’d have to spend for additional repairs. Plus sealcoating makes your parking lot look great too! The top Orlando sealcoating company is CSG. For 20 years we have been protecting parking lots in Orlando, sealcoating them and preforming other asphalt repairs. CSG has been the number one choice for Sealcoating in Orlando for two decades. Isn’t it time you put our two decades of experience to work for you? Sealcoating Orlando parking lots is an important facet to parking lot maintenance. It’s not something people usually think twice about, but parking lot line striping. Over time, all asphalt structures start to exhibit various types of failures. Copyright © 2017 CSG Paving & Parking Lot Striping. All rights reserved.